However, sometimes when our services are requested, our customers confuse the concepts of language and dialect. So this week’s post is devoted entirely to examining the differences between language and dialect. In accordance with the definition given by the Spanish Royal Academy dictionary, we can define language language as “the system of communication that is verbal and almost always written, belonging to a community of people”. This is a very general concept that can include any kind of language, from those that include images as well as signs. The only requisite that exists for a language to be considered as such is that it has its own grammar. What is the difference between language and dialect? When it comes to differentiating language and dialect there are more problems since the definition includes several connotations that can be interpreted differently. On the one hand, language is “the language of a people or a nation, or one common to several, however a dialect is considered to be derived from a language. Thus, Asturian is a dialect of Castilian Spanish. It starts to become controversial when the use of a dialect expands, to the point where it is spoken in a large region. This is when the lies that separate language and dialect start to become blurry, creating controversy. So, how do we tell the difference between them? 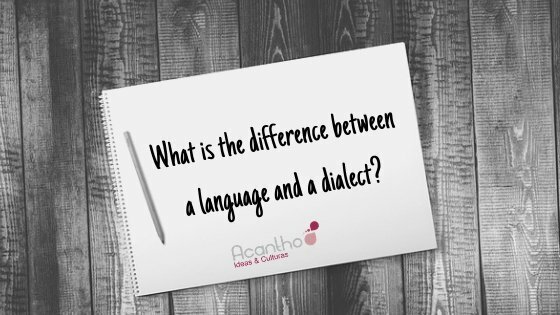 The best way to differentiate them is to think what language a dialect is based on and whether that language is used in a nation or for a people, or simply in a specific geographical area. P.S Did you know that the study of dialects (dialectology) is becoming more and more popular?